WASHINGTON, D.C. -- As the national divorce rate has fallen to its lowest point in decades, 73% of U.S. adults say divorce is "morally acceptable," a new high by one percentage point. Since 2001, there has been a 14-point rise in the percentage of Americans who find divorce morally acceptable, even as the national divorce rate has declined. These findings come from Gallup's annual Values and Beliefs poll, conducted May 3-7. 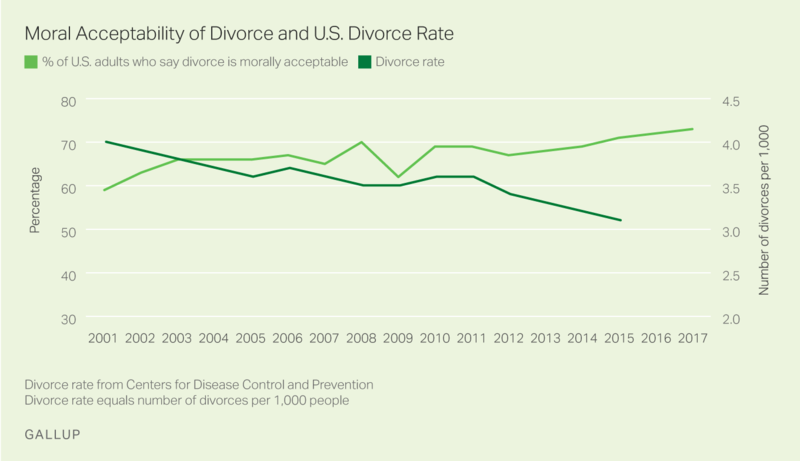 A wide swath of the U.S. public since 2001 has consistently viewed divorce as morally acceptable, according to Gallup's trend. But in earlier decades, divorce generated a fair amount of public discord. In 1954, Gallup found that a slight majority of Americans (53%) said they "believe" in divorce, while 43% said they did not. By mid-1968, a little over a year before California became the first state to permit "no-fault" divorces that allowed marital dissolutions to occur more quickly and cheaply, Gallup found that 60% of Americans wanted the government to make divorce in the U.S. "more difficult." Public policy, however, moved in the opposite direction, with 49 states adopting no-fault divorce laws by 1985. As laws changed in the last decades of the 20th century, divorce rates rose to historically high levels, particularly in the 1980s and 1990s. While scholars debated what the overall impact of this "divorce revolution" on society might be, certainly the increasing number of divorces in those years at least had the effect of making the legal procedure more familiar to many Americans. This may be why, in 2001, when Gallup first asked about the morality of divorce, a majority (59%) of Americans deemed it moral -- a result that would probably not have occurred in the 1950s and 1960s, had that question been asked then. In 2015, the proportion of U.S. adults who said divorce is morally acceptable topped 70% for the first time. That same year, incidentally, the divorce rate, as measured by researchers at Bowling Green State University, fell to a 35-year low. Meanwhile, the divorce rate, as measured by the U.S. Centers for Disease Control and Prevention, was also at a multidecade low. Historically, unmarried adults, excluding widows, have been highly accepting of divorce, even if they themselves were not divorced. From 2015 to 2017, 76% of U.S. adults who have never been married say divorce is morally acceptable, consistent with previous time periods since 2001. Those who are divorced or separated are no more likely than the "never marrieds" to say divorce is morally acceptable. Over the past seven years, married individuals -- once more reticent than others to say divorce is morally acceptable -- have had a significant change of attitude on this topic. In 2015-2017, for the first time, married adults were about as likely as unmarried adults to say divorce is morally acceptable. % Saying divorce is "morally acceptable"
The changing attitudes among married adults about the acceptability of dissolving a marriage might be yet another manifestation of the country's overall leftward shift on social values. More than any other major subgroup, "very religious" Americans -- defined as those who attend church or some place of worship at least once a week -- have been and remain the most morally opposed to divorce. But even their views have fundamentally shifted, such that, for the first time, a majority of this group (51%) calls divorce morally acceptable. Setting aside religiosity, feelings about divorce vary across the major religious groups. Americans who identify with a non-Christian faith or do not identify with a faith at all are substantially more likely than others to find divorce morally acceptable. Despite the Roman Catholic Church's official position on civil divorce, 73% of U.S. Catholics from 2015 to 2017 say divorce is morally acceptable, the same as the 2017 national average. Sixty-four percent of Protestants and other non-Catholic Christians agree. As in years past, there is no significant divide on the morality of divorce among Americans in different age groups. From 2015-2017, 76% of Americans aged 18 to 34 say divorce is morally acceptable, compared with about seven in 10 of those aged 35 to 54 and those 55 and older who also find the practice morally permissible. Acceptance of divorce has grown among all age groups since 2001, with the largest increase coming among the oldest Americans. From 2001-2004, 57% of those 55 and older thought divorce was morally acceptable, about 10 points lower than either of the younger age categories. Now, those gaps have been cut in half or eliminated, with acceptance of divorce among the oldest adults steadily rising to 71% in 2015-2017. Divorce rates have fallen below the heightened levels of the 1980s and 1990s, potentially indicating the "divorce revolution" has come to an end. This has not brought a return to an earlier era in which divorce was both uncommon and controversial -- instead, as the number of marital dissolutions dwindles, a record percentage of Americans view the practice as morally acceptable. But both of these trends -- the falling rate and rising acceptance of divorce -- are likely signs of a larger, more significant shift: society's changing attitudes regarding marriage. As divorce rates have fallen, so too have marriage rates as young adults delay marriage. And across all age groups, the practice of cohabitation has risen considerably, according to Pew Research. Gallup has also found that Americans are less likely to believe it is important for couples who want to live together or have a child together to get married. As U.S. adults come to see marriage differently than in the past, it seems natural that they will view divorce differently too. It may be that both marriage and divorce are no longer viewed in moral terms, but rather seen as legal or formal processes. Results for this Gallup poll are based on telephone interviews conducted May 3-7, 2017, on the Gallup U.S. Daily survey, with a random sample of 1,011 adults, aged 18 and older, living in all 50 U.S. states and the District of Columbia. For results based on the total sample of national adults, the margin of sampling error is ±4 percentage points at the 95% confidence level. All reported margins of sampling error include computed design effects for weighting.